IBM® Classification Module (Classification Module) Version 8.6 is an advanced enterprise software platform tool designed to allow organizations to automate the classification of unstructured content. By deploying the module in various areas of a business, organizations can reduce or avoid manual processes associated with subjective decision making around unstructured content. Organizations can also streamline the ingestion of that content into their business systems in order to use the information within the business systems more effectively. At the same time, the organizations can safely remove irrelevant or obsolete information and therefore utilize the storage infrastructure more efficiently. By reducing the human element in this process, Classification Module ensures accuracy and consistency and enables auditing while simultaneously driving down labor costs. 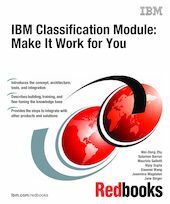 This IBM Redbooks® publication explains what Classification Module does, the key concepts to understand when working with Classification Module, and its integration with other products and systems. With this book, we show you how Classification Module helps your organization to automate the classification of large volumes of unstructured content in a consistent and accurate manner. The topics that are covered include building, training, and fine-tuning the knowledge base, creating decision plans, working with Classification Workbench, and step-by-step integration with other products and solutions. This book is intended to educate both technical specialists and nontechnical personnel in how to make Classification Module work for your organizations.